In a rather interesting move by the Buccaneers, the team will go back to Offensive coordinator Todd Monken this week to call the plays in their matchup against the Giants. Offensive coordinator Todd Monken will return to his play-calling post against the Giants, Koetter said Friday (via Greg Auman of The Athletic, on Twitter). Tampa Bay’s OC had called the shots prior to Koetter taking over against Washington. Koetter debated this decision throughout the week. Both coaches are surely on the hot seat for the 3-6 Bucs, who have lost five of their past six games. Koetter was viewed as a hot-seat occupant last season until he was surprisingly given a third season to right this ship. With that having not occurred to this point, Koetter and his staff may be on the verge of offseason relocations. Despite Jameis Winston failing to deliver this season, Monken’s offense still ranks first in total yardage and 12th in points. Those marks are well north of the Koetter-led 2017 Bucs’ placements (ninth and 18th, respectively). Ryan Fitzpatrick is completing 67 percent of his passes and is still averaging nearly 10 yards per attempt. Against Washington, though, the Bucs set a record by becoming the only team to surpass 450 yards and produce three or fewer points. Tampa Bay has never led the league in total offense, coming closest during Koetter’s final season as OC (fifth in 2015). 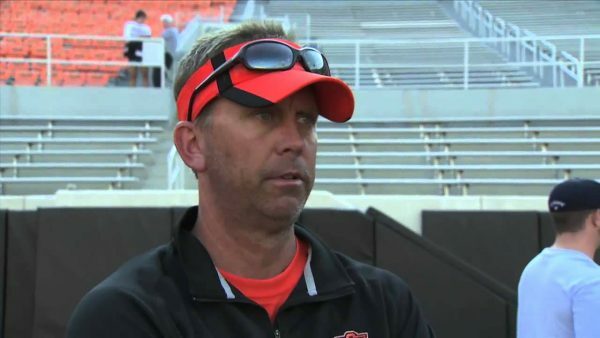 Although doing so for a team that’s careening out of the playoff race would be a somewhat hollow accomplishment, it would certainly look good for Monken this offseason, when he may have to look for another job. Tampa Bay To Target Patriots WR Welker In Free Agency? Video: Bucs Ronde Barber Retires – Is He A Hall Of Famer? Be the first to comment on "Tampa Bay OC Todd Monken Back to Calling Plays This Week for the Buccaneers"